When the grill gets fired up, you need to have a good lineup of condiments. Ketchup, mustard, and mayo are a must, but when I was growing up, you could never EVER forget the relish. Sweet Pickle Relish to be exact. Cucumbers are quite easy to grow, so if you have them in your garden this year, making relish is a great way to preserve the harvest. 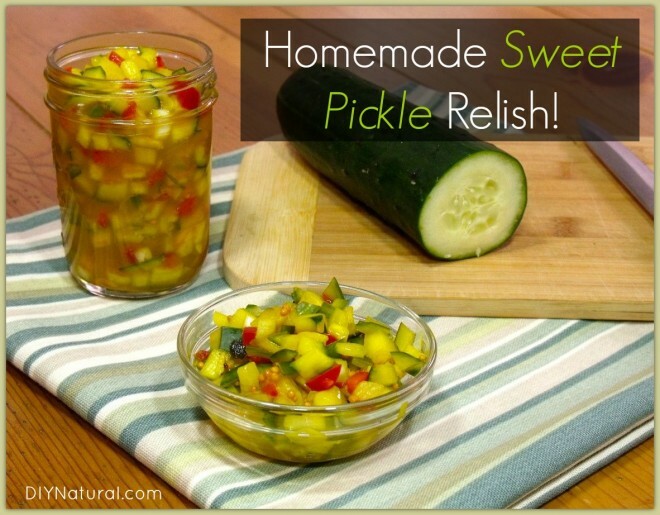 This sweet pickle relish recipe can make a small batch of refrigerator sweet pickle relish, or with just a few more steps it can be canned as a great way to preserve your pickle harvest and ensure you have homemade relish throughout the year. Cucumbers labeled “pickling cucumbers” will be more crisp than other varieties, so they are perfect for using in relish. Pick cucumbers that are dark green, firm, and full of nobby little warts. Overripe cucumbers will have yellow or white areas on the skin and the warts will be almost all gone. These overripe cucumbers will have developed larger seeds, which isn’t the most desirable for relish, and they will not be as crisp, resulting in mushy relish. After dicing your cucumbers and other veggies to your preferred size, you will salt them to draw out the moisture. To do this, place the veggies in a colander over a bowl and mix them with a little salt. Leave veggies for at least 30 minutes or up to 3 hours. This will keep your cucumbers crisp as they soak in the brine. After letting your veggies set with the salt, rinse them to remove any excess salt. Don’t worry about getting all the salt off because it will also help flavor the relish. Pat veggies dry to remove as much moisture as you can. In a medium saucepan (large if you plan on canning your relish), combine all the brine ingredients. Bring them to a simmer over medium heat and simmer for 10-15 minutes to reduce the mixture slightly. If you will be storing your relish immediately in the refrigerator, pack your rinsed and patted-dry veggies into clean, warm jars. Carefully pour the hot brine (with the spices) over the veggies you have packed into your jars, until they are just barely covered. If necessary, use a knife to move the veggies around and let the brine fill in all the cracks and crevices. Add lids to the jars and refrigerate overnight before using. Store homemade pickle relish in the refrigerator for up to 2-3 weeks. If you are canning your relish, you will need to transfer your rinsed and patted-dry veggies to the saucepan with your brine. Bring the entire mixture to a boil and simmer for 10-15 minutes. Pack your hot relish into hot, sterilized half pint or pint canning jars, leaving ¼ – ½ inch head space. Cover with fresh lids and hand-tighten the bands. Process your jars in a boiling water bath for 10 minutes. Remove the jars from the boiling water bath and leave them out to cool overnight. In the morning, check your lids for a seal. Refrigerate any jars that have not properly formed a seal, and use them within 2-3 weeks. Sure, you know relish is great on a burger, be it cheese-infused, veggie-laden, or even a bean burger. But don’t limit your relish to just a hamburger or hot dog topping. Try it in deviled eggs, potato salad, macaroni salad, or in homemade tartar sauce too! There is a print button at the bottom of every article. Blessings.